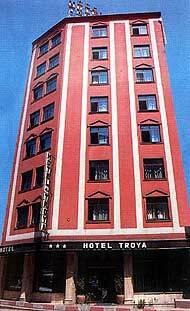 Troya hotel is located in Beyoglu, once known as Pera which is the business and entertainment center of Istanbul where the continents of Asia and Europe meet and is ready to serve you with its modern facilities and comfort. 150 beds are available in a total of 77 rooms-7 as suites- which have been furnished in modern style. All rooms are equipped with aircondition and sunken bathtub, 24 hour hot water facility, mini bar, fully automatic telephone, TV receiving broadcasts from satellites and 2 channel radio broadcast. Location: The distance from Atatürk airport is 16 km. *All rates are in Euro. *Except major credid cards and travellers cheques. *0-6 age for free, 7-12 age for %50.